I haven't worn a hat in years. That is to say, I've been known to wear a stylish fascinator now and again, or a bit of frou-frou in my hair when the occasion warrants. But hats...nah. A bit remiss considering I live in a Tropical climate, and a bit of shade on ones face is almost compulsory if you don't want to look like a prune by the age of 40. Nonetheless, I have sailed a fair ways past 40 now (17 years past as a matter of fact), and thanks to judicious applications of sunscreen, the old visage hasn't suffered too much. I did wear a hat on my wedding day. And opera length gloves, and damask shoes. It was an Aussie Bush style wedding in the country, with thick steaks cooked on an open air barbecue, and King Prawns for lunch, and a live band. But I saw no reason to skimp on the glory of being a bride! Here they are. Sweet, eh? Hats haven't figured largely in my day to day life since that day, nearly 20 years ago. They squash my curly hair, they're unwieldy in even a small breeze, and there aren't too many hats I like, quite frankly. But there comes a time when one must face up to the fact that a hat makes sense. It helps preserve whatever bloom of youth one may still have. It's built in shade. It's easier to wear a hat than to carry an umbrella for personal shade, which I have been known to do from time to time. Not only that, but invariably one just needs a hat to wear to a Raceday event (hats are de rigeur at the Races), the beach, or even a wedding. Who wants to be racing out (no pun intended), overspending on a hat that you're only going to wear once to Cousin Nellies wedding, or the Back-of-Bourke Races? I've suddenly realised that life is short, and I cannot bemoan the passing of the Age of Glamour (including hats, gloves and gorgeous shoes), when I am not personally upholding that Age of Glamour. It's time for that to change. Who cares what anyone thinks? I want to be remembered for being the Glamorous Granny, so here goes! The black hat I've chosen above, ticks all the right boxes for me. It's broad brim and wired edge, make it easy to shape into a flattering face frame. It's snug without being tight. It's what we used to call a Picture Hat, and it's similar in many respects to the one I wore on my Wedding Day. Sure it flattens my hair a little, but not so much that it bothers me, and styling products these days cure a multitude of Hat Hair ills. Most importantly, my black picture hat will see me looking stylish whether at the races, the beach, or on my morning walk. It fits the criteria of Chic...simple and elegant with no unnecessary embellishment. If the mood takes me, I can attach a bit of frou-frou in the form of a flower, ribbon, a scarf, or hailspot netting to glam it up a little. It's a great base from which to work. Buying a more fancified hat, would not give me that flexibility. I swear that boy reads my mind sometimes! I love this one too, and the addition of the jumbo rick-rack around the brim, makes it no less versatile. Lucky me. I now have two perfect hats. What about you? Do you wear hats? Is now the time to find the perfect versatile hat to add to your accessories list? 1. Stick with a neutral colour. Try natural straw, white, cream, black or tan. 2. Find a material that suits the climate in which you live. The tropics dictate straw or straw like construction. Cooler climes might prefer felt, leather, or even faux fur. 3. Find a shape that frames or enhances your face. This style suits me, but might overwhelm someone with more pixie like features. 4. Consider the shape of the crown section as these too, can change the look. Note that my first hat has a traditional domed crown, whereas the hat my son bought me, has a flat Sombrero like crown. Believe it or not, this makes for an entirely different look. 5. Find a brim size that balances your silhouette. Too big and it will overwhelm you. Too small and it will look like it was made for a child. 6. Decide how you will wear your hat? Will it sit front and centre? Or will it perch jauntily to one side. Further forward? Or sitting more backward? These details will help you choose a hat that truly flatters you. 7. Browse hats on Pinterest, and find a few that catch your eye. Then try to determine what the common denominators are. Is it the shape? Is it the colour or the embellishment (or lack thereof)? Is it the way the model is wearing it? Does it hark back to a particular era? List the commonalities as these will help you in choosing your own perfect hat. Do you favour Picture Hats like mine? 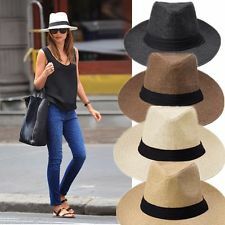 Or do you lean towards Fedoras like this one below? 8. 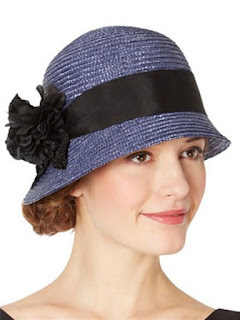 Decide how you will wear your hair under your hat, and wear it this way when you shop. Will you wear your hair long and loose, or sleek and neat? The way a hat looks when worn with long hair, will differ from the way it looks if you've secured your hair into a sleek bun or ponytail. 9. What will you wear your hat with, and where? Try to picture these outfits or events when trying on hats. 10. Avoid too many embellishments. You will gain more wear from your hat by choosing something simple, and adding your own embellishments as the occasion dictates. I'm a fan again. I love my new hats, and wear them daily in the heat here in Australia. Soon the weather will cool, and I just know I'll be looking for my very own Cloche, or Fedora to see me through Autumn and Winter. I look forward to my hats livening an outfit, dressing up a lunch date with my friends, giving me shade or keeping me warm (you lose a lot of body heat through your head! ), and just making me feel a little more glamorous. Your hats are lovely. I have always worn a hat and sunscreen, yet I have badly sun damaged skin. I currently have three hats that are worn regularly. I have a bucket hat that lives in my substitute teaching 'go bag'. It is not a pretty hat but it is functional for yard duty. It can be scrunched up and shoved into the bag. I have two akubra style hats. One is a cheapie leather one picked up on holidays years ago. This is my beach combing and gardening hat. It has a nice wide brim and pulls down tightly so the wind cant pick it up and run away with it. The second is a black moulded cowboy hat. I have worn this to races as my good hat. I just add a flower or a scarf to give it a bit of a colour lift. This hat has been through quite a lot of travelling and needs to be replaced. I think it will be demoted to my yard hat once I find a decent replacement. I am rather fond of the style of hat your son gave you. Might have to visit the cancer council shop and see what they have. Mimi, I love hats and always have. In summer I wear one similar to the last photo but in straw, bought from the op shop for $3, but new in Blue Illusion(french inspired store) $75. I also have a wider brimmed hat from Billabong for summer. Winter brings out several beanie type hats(need my ears covered). My major problem, and yes my siblings, DH, and DD's laugh is a small head, so I often have to buy children's hats. your hats are all so wonderful and you wear them so well, you're so lovely in your first picture, simply adorable ! Mimi, Love your new hats! I have too many to mention, they are all wide brimmed. I do love my hats. Mostly hats aren't fashionable around here but I wear mine anyway. They make me happy! Beautiful hats, and you look lovely! Cute hats. Thanks for sharing at Monday Social. I love hats, Mimi! 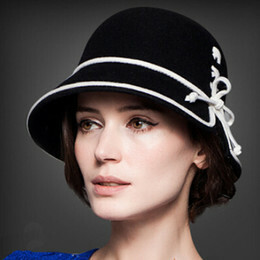 Especially a great cloche...they are so classic!